At last! One of MY holidays has arrived! National Peach Cobbler Day! For REAL! I lost no time in finding a peach cobbler and...I am in my glory. 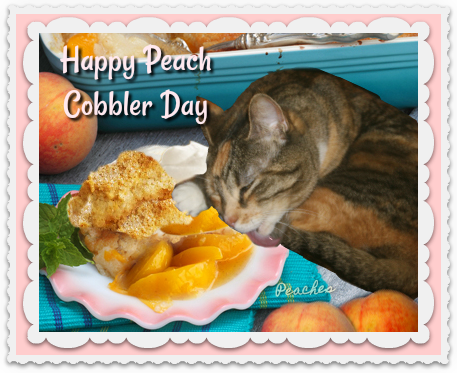 Happy Peach Cobbler Day to all! You can read more about it here! You're such a lucky, yummy girl! Yums! And knowing our Dad, he'll insist on some vanilla ice cream for the side. . . and we'll get some! Cute photo. Happy Peach Cobbler Day! It should be later when it is peach season. Happy Peach Cobbler Day, peaches! What a fun holiday! Eat up, Peaches! I think everyday should be peach cobbler day!